Here’s a revamp of one of my favorite comfort foods to enjoy, particularly in cold weather: The Strata. A Strata is much like a bread pudding…in fact the ingredients are almost the same. In my mind the main difference lies in layering versus mixing the whole together, along with the proportions of egg to milk or cream. The strata is “egg-y,” and the bread pudding has more of a “custard-y” quality. Because of these slight variations, the two are actually a bit different in both texture and taste. The strata allows you to use thinner pieces of bread and fewer pieces as well, which are then layered with other ingredients. You add just enough moisture from the eggs and milk to hold it together, then top it with cheese. The result is sort of a baked sandwich with a fluffy texture. A bread pudding heavily relies on thick cut or torn chunks of bread soaked in a lot of custard to give the finished product a true pudding texture. Traditionally, bread puddings can be sweet or savory, but strata are most always savory. And much like the frittata you saw in my last post, you can customize your strata to suit your taste or to accommodate what you have on hand by changing the type of bread, filling and cheese. In the end, the lines between strata and bread puddings can be blurry for sure, but the results are always delicious! And often quite caloric…which brings me back to the “revamp” part of this post. Given that I am trying to continue the idea of “leaning up” some recipes without sacrificing flavor and texture, I came up with a modified strata, one that’s jam-packed with veggies. But it’s not just lots of veggies that provide the revamp. I’ve also used a flavorful multi-grain and seeded sliced prairie bread as the base, lower fat milk instead of cream, added some sweet spice, a hint of sherry and just a little bit of strongly flavored cheese to round out the taste and mouthfeel. I can tell you that the result is wonderful! As I said, this leaner version is much more healthful than my usual savory bread puddings. With the adjustments I’ve made, I’d say this strata has 1/2 of the calories and fat, but all of the homey comfort food quality that I have always loved. It’s a meal unto itself and can be served for breakfast, lunch or dinner. You could also enjoy it with a fruit salad, if you like. This reheats well in the microwave, too, so even if there’s just one or two of you around to eat it, leftovers can be kept in the fridge and used as needed. I haven’t tried freezing it because we eat it up quickly, but I think it would freeze well. 1. Spray a 7 inch by 11 inch glass pyrex casserole with olive oil and set aside. 2. In a non-stick skillet over medium heat, warm the 1 tsp olive oil and then add the chopped onion. Sauté until the onion is tender, translucent and just beginning to caramelize, then add in the mushrooms and cook until they are tender and most of their moisture has evaporated. Sprinkle the mixture with a tiny bit of kosher salt and freshly ground black pepper, the fresh thyme and the sherry. Stir to combine. Remove from the heat and set aside. Line a baking sheet with foil. Lay the slices of bread on the sheet and preheat your broiler. Lightly toast the bread on both sides, remove from the oven and set aside. Turn off the broiler and preheat the oven to 350 degrees F. In a large bowl, whisk together the eggs, milk, nutmeg, 1 teaspoon of salt and 1/2 teaspoon of pepper. 3. Assembly: Dip each piece of toasted bread into the custard mixture to fully coat it, then arrange each slice of the coated bread in the casserole slightly overlapping like a deck of cards. Pour the remaining custard mixture evenly over the bread. 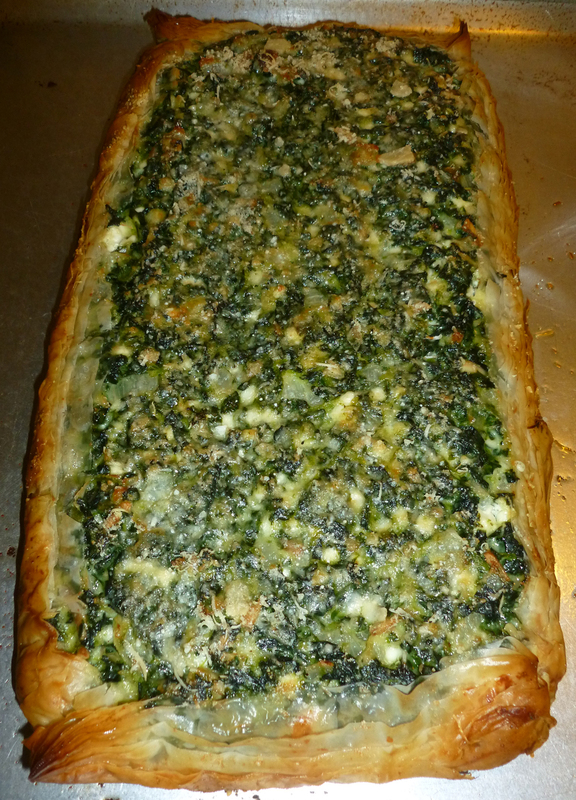 Tuck the cooked onion and mushroom mixture, chopped spinach and chopped artichoke hearts in evenly in between the slices. Sprinkle the gruyere cheese over the top and lift the slices with a spatula to allow some of the cheese to slip in between. Press down on the strata to even it out and to allow the bread to soak up the custard. 4. Place the dish with the strata onto a foil-lined cookie sheet to catch any drips. Put it into the oven and bake for about 45 minutes at 350 degrees F., or until golden brown and just set. After 45 minutes if it still need more time, cover lightly with aluminum foil to prevent over browning and continue to cook for 10 more minutes or until done. The strata is done when it is golden brown on top, slightly puffed and a knife inserted into the middle comes out clean, without egg. Remove from the oven. Cut into 6 pieces and serve. Leftovers will keep in the fridge for 3 days. This can be made the night before, covered and placed into the fridge. Allow it to sit at room temperature for about 20 minutes before baking. Remove covering and proceed as above. We enjoyed this strata on a blustery and snowy night…a rare thing in our parts. But you don’t have to wait for some snow to warm up to this recipe! Not the most carefully composed nighttime shot, but a nice quiche just the same! Sometimes pie is just the right thing for dinner or dessert. 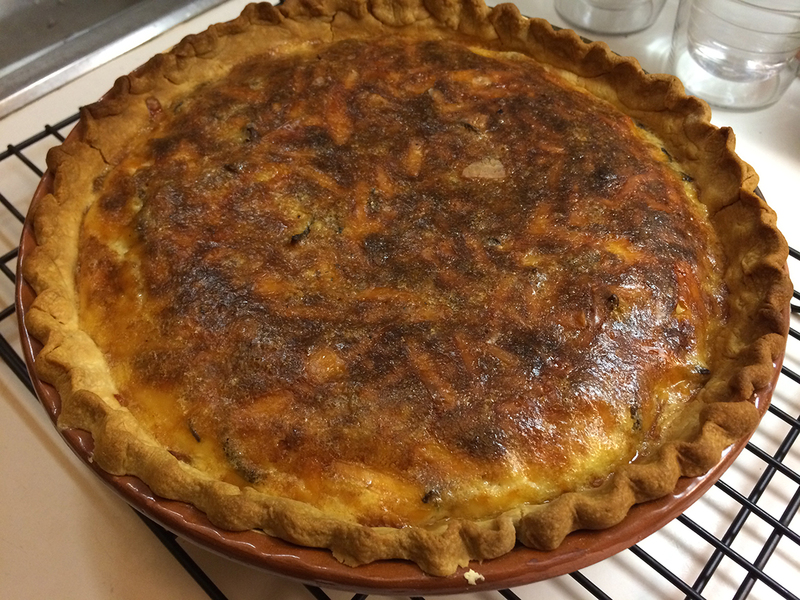 This is the first of two pie recipe posts…one savory pie and one sweet. Another dish I could eat every day and be quite happy, thank you! It’s a night shot so please excuse the flash. Perhaps I should digress enough to say that I’ve suffered from “fear of phyllo” in the past, afraid that it would dry out before I could have my way with it, so to speak. But I find it well worth the minimal effort it takes to work with phyllo. Just keep the portion you plan working with unrolled on plastic cling film, wax or butcher paper and under a damp cloth, covering the remaining sheets each time with the damp cloth as you are working on the others, and you should be just fine. I’m sure there will be instructions to that effect on the package. This recipe makes a fantastically full-flavored tart that is good for lunch all by itself, or for dinner served with a side or a salad such as the Mediterranean one in the last post. I would definitely make this for company and will also be modifying it soon, using smaller pieces of the phyllo pressed into mini muffin tins to make appetizer tarts. 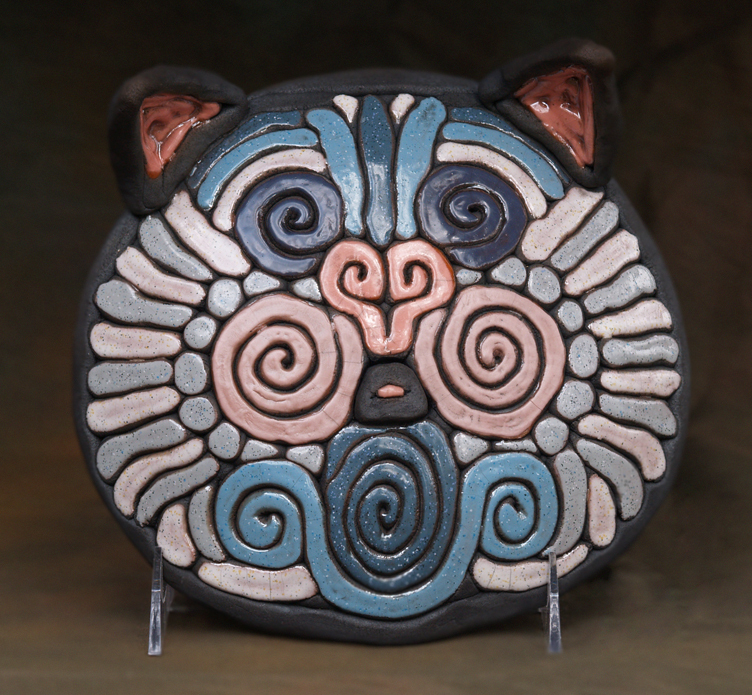 And on another note, and I hope an interesting one for you, this week has been about some new beginnings for me…or rather a return to some creative endeavors from my past. Stay tuned for a little departure post, hopefully by the time of my next one, to share what’s going on. Meanwhile, enjoy this recipe, have a great weekend and here’s a little teaser photo to whet your interest! Brush some of the melted butter on a large baking sheet or flat pan and set aside. Preheat the oven to 375 degrees F.
Heat the olive oil in a large, non-stick skillet over medium heat. Add the onion and the garlic, stirring until the onion is softened and transparent, about 3 minutes. Add the spinach, salt, pepper and nutmeg to the onion and garlic, and cook a minute or two longer, stirring, until any liquid has evaporated. Remove from the heat and allow to cool for 4 minutes. In a large mixing bowl, combine the eggs, feta, cottage cheese, almonds, Panko bread crumbs and the spinach mixture stir until well mixed. Working on the flat surface of your buttered baking sheet, lay down 1 sheet of the phyllo dough and, using a pastry brush, brush it lightly with some of the melted butter. Sprinkle about a tablespoon of the parmesan cheese over the butter, then top with another sheet of phyllo, repeating the butter, parmesan and phyllo sheets until all eight sheets are stacked on top of each other. Spoon the spinach filling down the center of your phyllo sheet, spreading it evenly and leaving about two inches of the phyllo uncovered all the way around it. Fold up the two long sides of the phyllo to just come up and over the top edge of the filling and brush the edges of the phyllo with some melted butter. Fold the two short ends of the phyllo just up and over the short edges of the filling and the ends of the long sides to make an evenly folded “package” and brush those ends with butter to seal it. 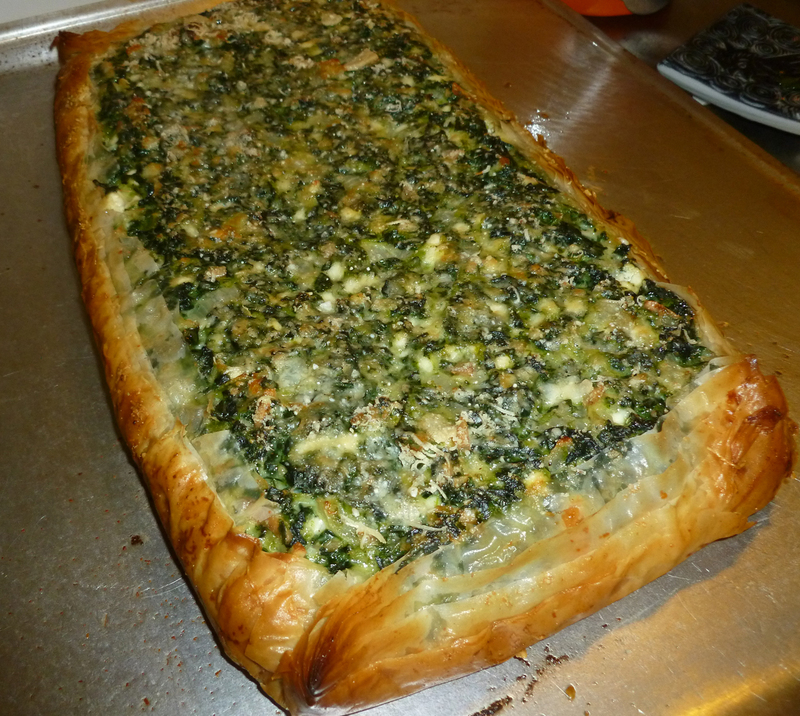 Sprinkle the remaining parmesan cheese over the top of the spinach filling, and bake the tart in the oven until the tart is lightly browned on the top and the phyllo is golden brown (see photo below.) Remove from the oven and allow the tart to sit for about 5 minutes. Slice crosswise into six even slices and serve warm or at room temperature. If there are leftovers, they keep well completely cooled, placed in the fridge and reheated gently in the microwave the next day. The phyllo stays amazingly crisp! Sometimes a bowl of warm, green soup is just what the doctor ordered. 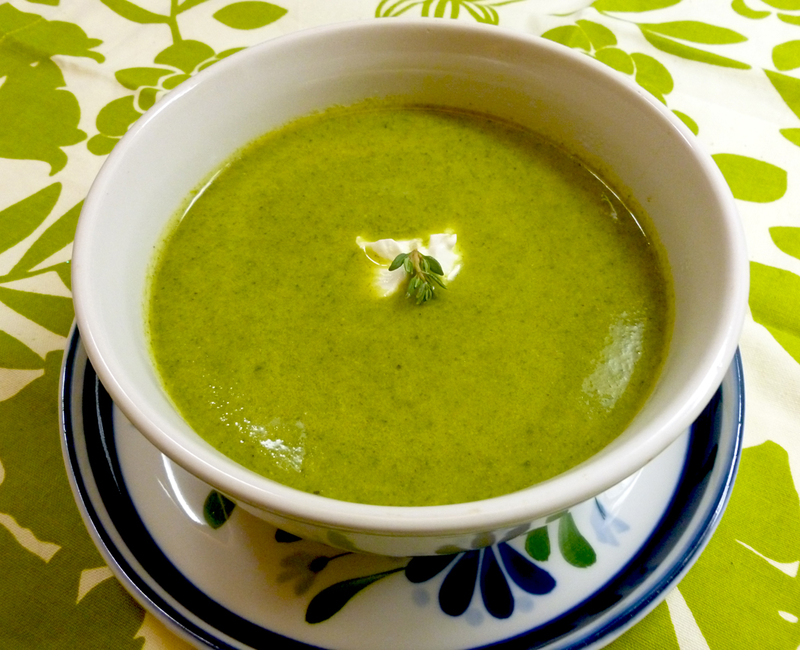 This beautiful soup is a lean, mean and green antioxidant machine...and it makes me happy! It was the end of a very long, and emotionally exhausting week, and the thought of just staying home and making dinner was a pleasure. But what to make?